If you're in marketing or analytics, you know consumer behavior has shifted dramatically — mobile has created new opportunities for businesses to reach customers at the right moment with the right message at every step in the buyer journey. 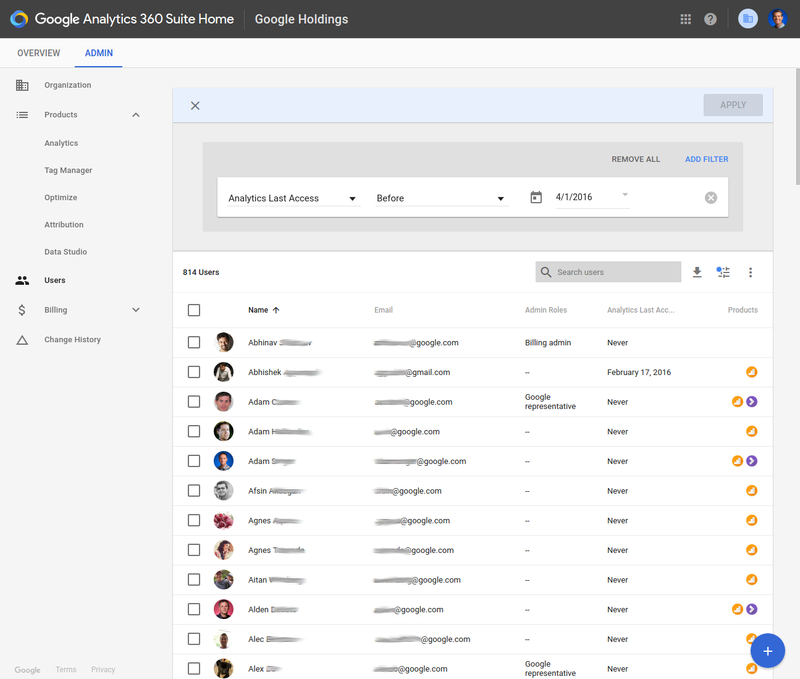 That’s why earlier this year, we launched the Google Analytics 360 Suite, a set of integrated data and marketing analytics products, designed specifically for the needs of enterprise-class marketers and data analysts. Since this launch, we’re now excited to announce a series of improvements available to Suite customers. 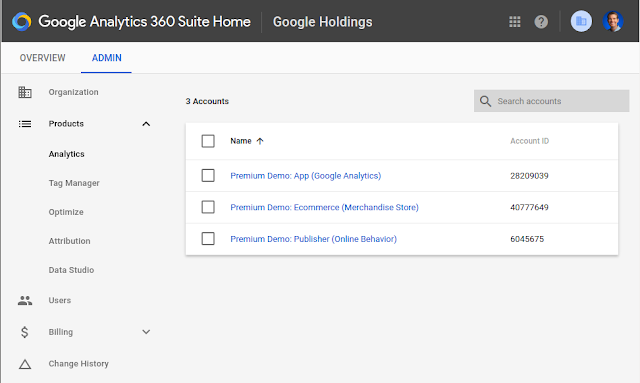 The Google Analytics 360 Suite houses vital data for marketers to understand how their marketing programs, websites, and apps are performing; carefully controlling access to this data and monitoring what happens with it is a top priority, and we’ve made solid improvements. Linked accounts must be verified before user management features will apply to them. 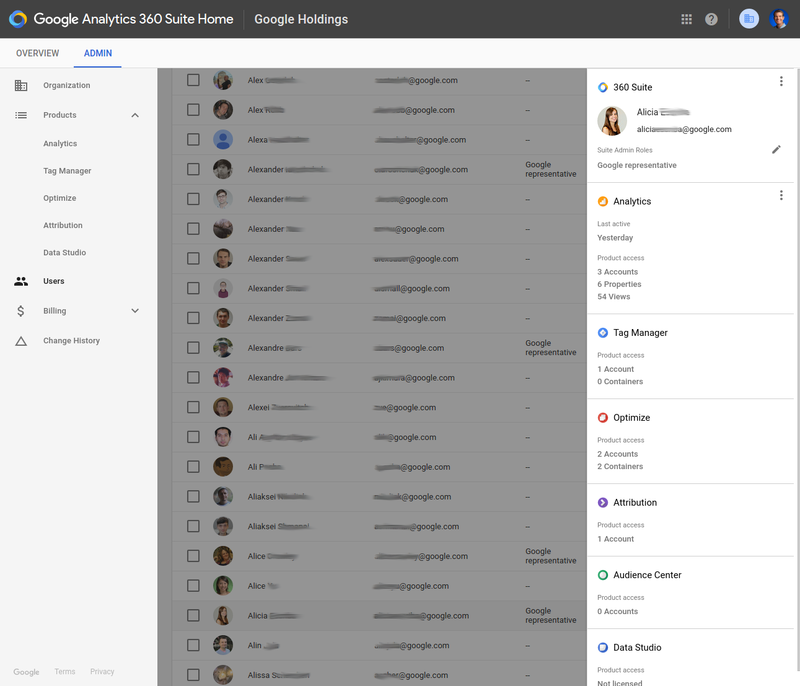 Once you have linked and verified all of your accounts within Suite products, we compile a powerful user-auditing report for you. 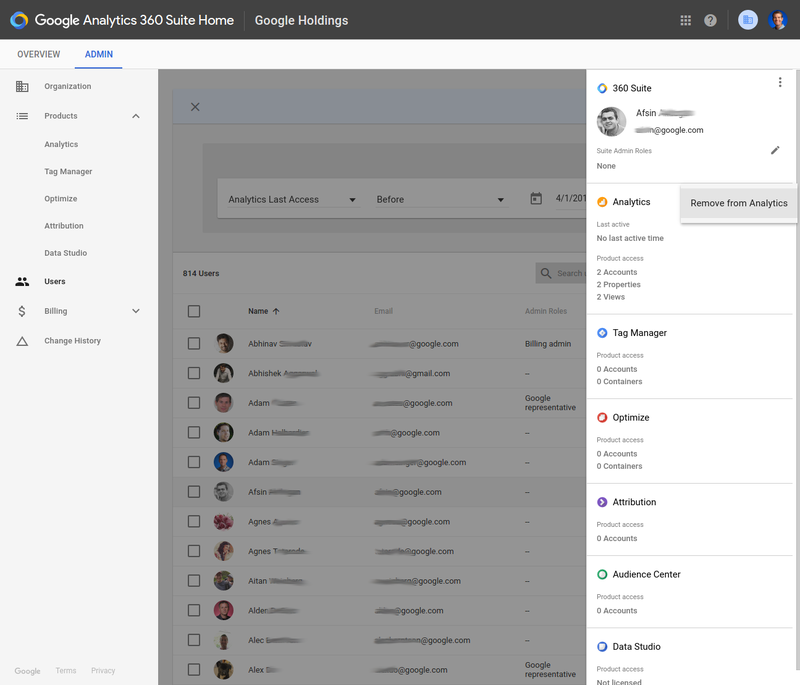 This report lists all users that have access to any of the accounts you linked across all Suite products. This is the only place where you can find a cross-product and cross-account list of users. For each user in this report, we list rich data to help you make informed decisions about who has access to your corporate accounts. We show the user’s name and picture (when available), their Suite roles, and which products within your organization the user has access to. For all linked Google Analytics accounts, we show the last time the user accessed data from any of them. Even more details can be loaded per user to show a summary of all the data that user has access to, such as how many properties or containers the user can access, whether the user is licensed for Data Studio, etc. Suite Change History lets you keep track of when a change was made, who made the change, and what was changed. For example, you can easily see when someone linked a new account to your organization, added or removed users, changed the service level for an object, or changed the end date on an order. Having a record of these changes eliminates confusion over something like an increase in billing. Instead of wondering, you can search your change history to see that one of your administrators changed the service level for a property from Standard to 360, or made changes to the billing parameters. Access to change history is restricted to Owners. 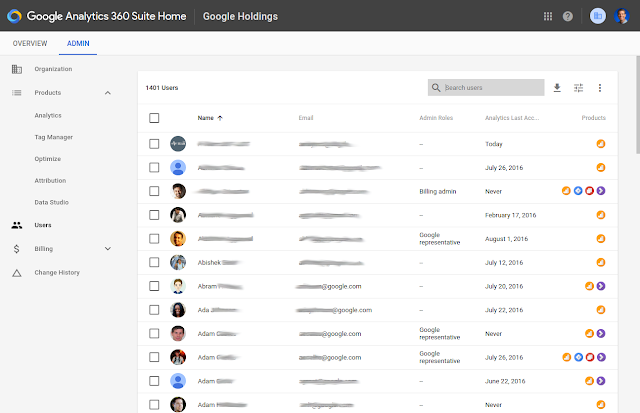 Organization administrators can login to 360suite.google.com to complete their Suite setup and start using these features right now; contact your account manager if you’re not sure who your organization administrators are. Verify all accounts linked to your organization, then visit your Organization page in Suite Admin to enable the Suite experience today. Put all these powerful administration features to use right now for your organization to tightly monitor & control access to your valuable data. We have many more improvements planned for the future; so stay tuned as we launch more, and truly bring an enterprise-grade experience to life in the Google Analytics 360 Suite.